"Finest blades on the planet!" 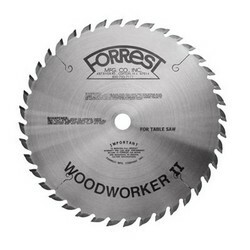 WOODWORKER II saw blades are designed for table saws. With this one all-purpose blade, you can rip and crosscut 1" - 2" rockhards and softwoods resulting in a smooth-as-sand surface. Ply-veneers of oak and birch will crosscut with NO BOTTOM SPLINTER at moderate feed rates. Side wobble is held to .001" - with other brands .004/.010 is common! 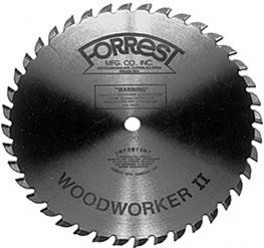 MOST WOODWORKER II's ARE IN STOCK FOR QUICK SHIPMENT!